You'd be forgiven for assuming that wearable tech is all about fitness trackers and smartwatches to help shed the pounds and keep you on track to reach your fitness goals. We've seen a steady rise in tech aimed at keeping our minds in shape, just as much as our bodies. Stress tracking is one of the most wanted features from wearable tech, while major players like Apple and Fitbit are even getting in on the calming act. There's been little conclusive research to date into the benefits of strapping tech to ourselves to keep us more calm, more grounded and more focused. But we've collected together some of the most interesting devices that claim to be built for your brain, some of which are available now, with others coming soon. Before we get to the more dedicated wearables that aim to tackle your stress, let's explore the smartwatches and fitness trackers that are now equipped at delivering features related to staying calm. Keep in mind that these aren't giving you the most advanced and dedicated stress tracking smarts, but the options below do help you keep an eye on the likes of breathing, resting heart rate and more. Apple's third generation smartwatch continues its sporty incline and adds some handy cellular connectivity, but it's not all about tracking your runs and swims without your iPhone being present. First introduced through watchOS 3, Apple's smartwatch now features the Breathe app, with the goal of helping you to relax by focusing on your, well, breathing. Using the Watch's taptic engine, you can pick from one or five minute sessions. A series of small vibrating buzzes will replicate a more calming breathing rhythm as you follow the instructions on the Watch display. It will also monitor heart rate to add to your breathing session data. That's not the end of the monitoring, though, with the device's built-in heart rate monitor providing information on your resting heart rate and how long it takes you to recover after exercise. Both are good indicators of heart health, and though fluctuations in your resting rate are normal, an increased spike could help you confirm up any feelings of stress. While Fitbit packs some its wellness features into the Charge 2 fitness tracker, its first true smartwatch is the best of the company's devices for wellness. Also available for the Fitbit Versa, Relax uses the onboard heart rate monitor and HRV monitoring to detect changes in heart rate and offer personalised breathing options that are available in two-minute or five-minute sessions. When you're not taking a breather, there are all the usual fitness tracking features to make use of, along with sleep tracking and the continuous Cardio Fitness Score (Fitbit's equivalent of VO2 Max) monitoring to determine your current state of health. In our view, Fitbit's round-the-clock tracking on both of its smartwatches does help build a more complete picture of your health when compared to Apple, and that could be a deal-breaker for some. Like some of Fitbit's crop, Garmin uses the Vivosport to adopt a more mindful approach to fitness tracking. Using heart rate variability (HRV), the Garmin wearable is able to track your heart and present a stress level score at any moment of the day. If it happens to be high, you can kick off a guided breathing exercise to re-centre yourself. The Vivosport also packs in a different display than its predecessor, the Vivosmart 3, and offers gym-friendly features like rep counting to keep a closer eye on your strength training sessions. As you can probably gather, smartwatches and fitness trackers tack on stress-related features as part of a wider play for your wrist. If you're looking for something more targeted, and something which goes beyond the stress tracking basics, check out the list below, which includes everything from head-worn devices to smart jewellery. In 2016, we tried out Thync's Vibe, a small triangle that sits on your head and uses ultrasound to raise energy and lower stress. 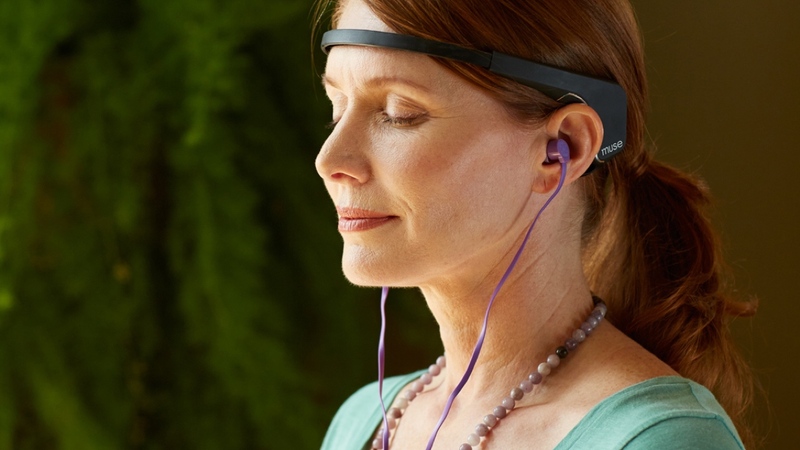 Now, the makers of the mind-altering headset have tweaked the design for the stress busting Thync Relax Pro. The device, which sits around the neck and uses similar technology featured in the first device that creates a kind of mini massage where you can control intensity from the Thync companion app. These feel-good signals aren't just meant to make you calmer, but also help you get a better night's sleep. We found it definitely helped us wind down - you can read more by jumping over to our full review. Dubbed as smart jewellery, rather than a headset or run-of-the-mill wristband, the Leaf Urban from Bellabeat is the startup's second generation activity tracker designed to monitor steps, sleep and ovulation. Built with women in mind, the Bellabeat also has a huge focus on stress levels at its core, with dedicated features on the way in the near future. The device works on the premise that shallow, rushed breathing equals stress, so it monitors your breathing and teaches you how to re-focus and calm your mind through a series of breathing exercises that you can easily visualise with the Leaf's accompanying app. The Spire Stone is a small wearable device that clips onto your clothes and monitors your breathing. And using a series of sensors, Spire keeps an eye on inhalation and exhalation times, your breathing rate, the steps you take and the calories you've burned. It pairs up with an app that will deliver guided meditations and tips for chilling out when the device senses you're tense or your breathing is hurried and shallow. The fact it also keeps an eye on steps and calories means it's a great all-rounder, if you'd rather not spend all your wearable budget on a breath tracker. There's further good news, too - Spire now works with Android phones, as well as iPhones. After launching its first device way back in 2016, the Touchpoints Basic promises to kill your stress in just 30 seconds. Worn on both of your wrists or clipped onto your clothing, the Basic wearables harness neuroscience technology sending alternating vibrations that aim to alter the body's Fight, Flight or Freeze response to stress and anxiety. This will then apparently restore homeostatic nervous system functioning, which will allow you to think clearly and become calmer. Muse is all about sensing what's going on in your brain and allowing you to change your state yourself, rather than zapping you with electric signals. Using seven EEG (Electroencephalogram) sensors along your scalp, the Muse measures your brain activity in real-time and alerts you to calm and stressed moments through audio cues. It then guides you through a series of exercises in order to train yourself and identify distractions. The idea is you'll then be able to go it alone and apply these calming techniques to your daily routine. So it's essentially just meditation for those who need a tool to help them out. The WellBe might look like your average fitness tracker, but it's built for wellness, not fitness. A built-in heart rate monitor detects your stress levels based on time, location and the people you meet. The WellBe app will paint a picture of the things that trigger your stress levels, the premise being that more awareness will enable you to better deal with certain people or events. Whether this works to empower or overwhelm you in the real world remains to be seen. It also provides you with ways of reducing your stress levels when they soar, meaning it's not just about detecting stress but serving up solutions too, like meditation and focused breathing, when you need them. Currently, for unknown reasons, it doesn't appear available to buy through WellBe, but heading over to Amazon should see you right.